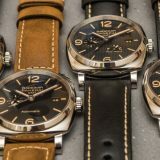 After being taken over by the Swatch Group a few years ago, there were concerns that the brand and its designers would not remain independent artistically. 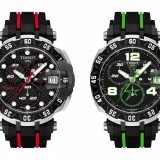 The latest offering, the Avenue Dual Time Automatic confirmed that this fear is unfounded. 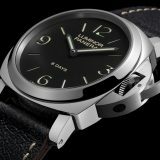 The brand continues to show the “out-of-the-box” thinking to watchmaking that has excited luxury watch aficionados all these years. With its powerful design, unique indications, and bold sophistication, the new Avenue Dual Time embodies Harry Winston unsurpassable approach to watchmaking. 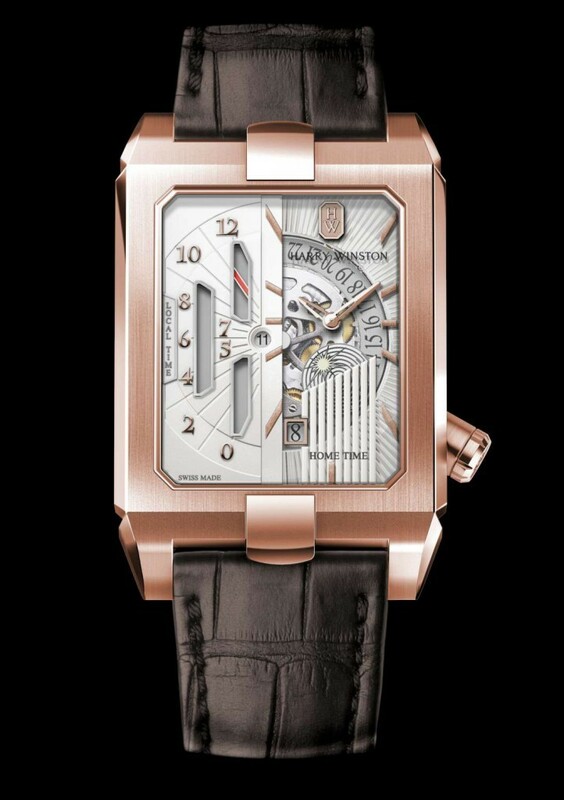 This perfectly masculine timepiece, with its geometric lines, sizeable proportions, and wearable quality, does not follow traditional design principles. 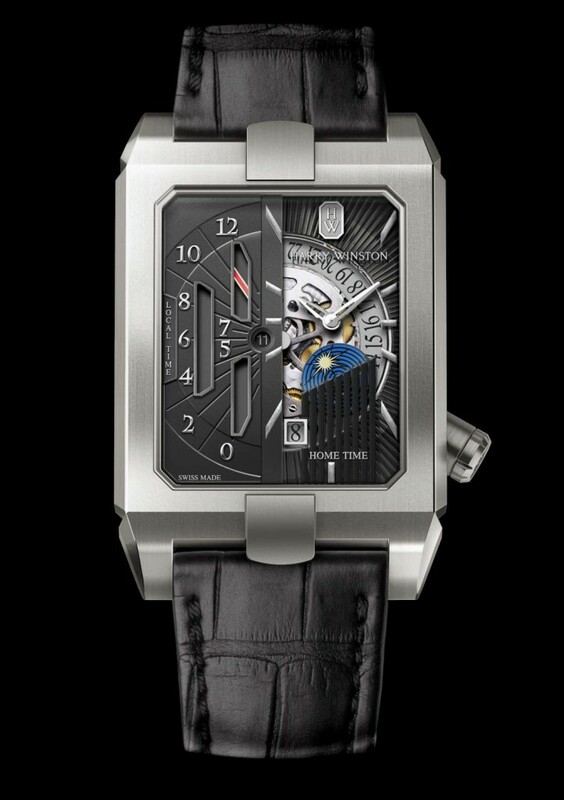 It features an off-center dial for local time and a retrograde indication for a second time zone, exemplifying the spirit of Harry Winston’s complicated watchmaking. The Avenue Dual Time Automatic is a dual time zone watch encased in a rectangular casing which is water-rated to 30 meters. With the dimensions of 53.8 mm long and 35.8 mm, it does appear to be. 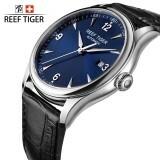 However, the use of a curving caseback and sloping lugs coupled with a thickness of just 10.7 mm make this watch exceptionally comfortable to wear. 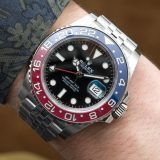 It can also be worn by people with smaller wrist sizes that would otherwise not even consider this watch due to the stated dimensions. 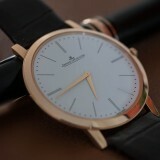 This watch is available in two versions, rose Sedna gold, reference AVEATZ37RR001, and Zalium, reference AVEATZ37ZZ001. The Zalium case is matched to a main dial in smoked sapphire crystal and a black upper dial with white gold applied markers, while the Sedna gold case is matched to a main dial in white smoked sapphire crystal and a silvered upper dial with pink gold applied markers. What most unique and intriguing about the watch is what you get on the dial. 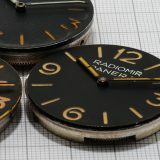 The dial is divided into two halves. 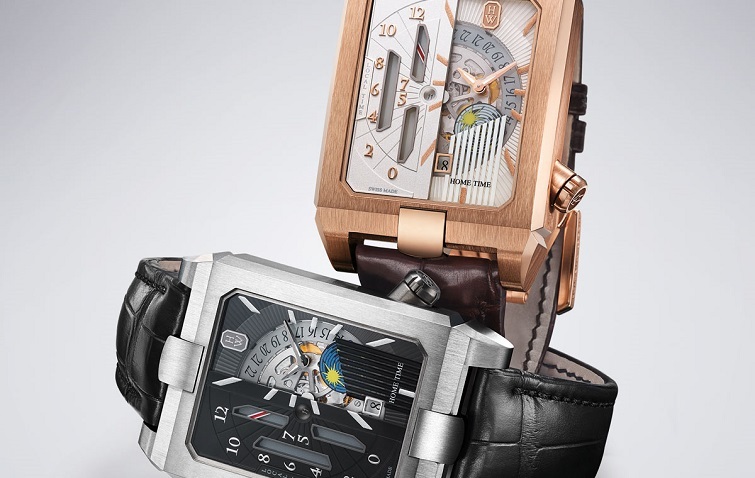 On the right is the main time zone or Home Time and on the left is the second time zone or Local Time.The Home Time section is skeletonized with analogue hour and minute hands, a day and night indicator, and a date window. There is no seconds indicator. 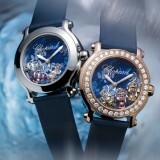 On this side of the watch casing, the rather steampunk-like crown is located at the 5 o’clock position. The Local Time section has a retrograde display marking the hours, and a small circular window showing the same time digitally. This style of measuring local time is something that I personally prefer. 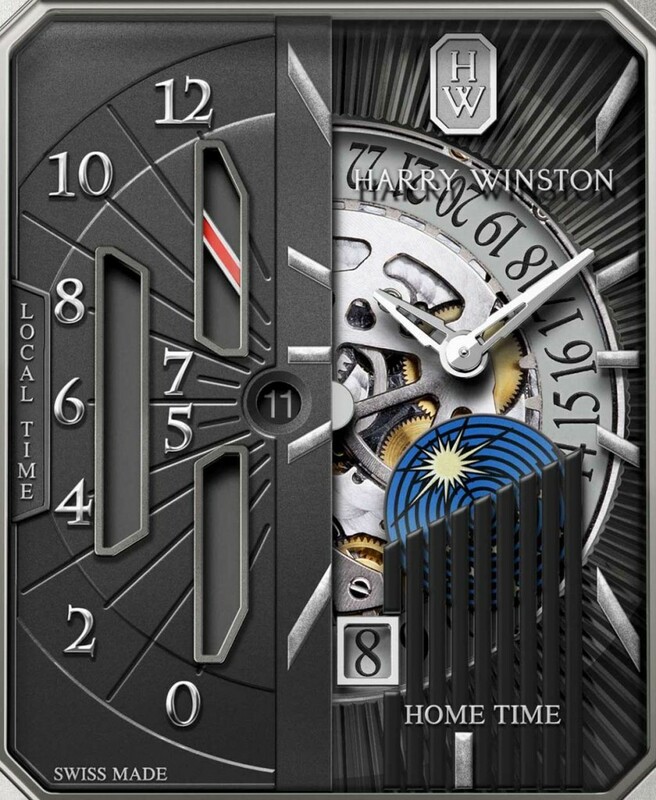 Although purists insist the two-hand hour and minute display should be for the local time, and the hour-only display should be for home time, I prefer it the way Harry Winston set it up in this watch. To me, the two-hand hour and minute display should be for home time as this time is more important to me compared to the local time where I am located for just a short space of time. 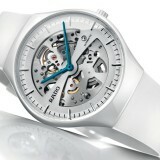 The watch is powered by the HW3502 movement. This movement is based on Blancpain’s calibre 1150. It has a silicon balance spring for good anti-magnetic properties. The movement runs at 28,800 vph and is made out of 281 parts. The movement can be seen via the display caseback and it is finely finished with C?tes de Genève, circular graining and chamfered bridges. Perfect for the world traveller, the main time zone on this timepiece also has a day/night indicator. The second time zone works in a different way. Pulling on the crown removes the red hand from sight. The time is set using a small disc located in the opening at the center of the dial. Pushing in the crown, the hand returns to its position. This sequence is essential to the proper functioning of the retrograde system that displays the local time. The hand moves gradually from 0 to 12 o’clock, before instantly returning to 0 to start over. Apart from reinforcing Harry Winston watchmaking capabilities, the watch also demonstrates the synergistic benefit of being part of the Swatch Group. The ability of using Sedna gold, an Omega rose gold alloy and Blancpain’s movement opens up a lot of possibilities.